On June 16, 1904, Irish author James Joyce had his first date with Nora Barnacle, the woman who would become his wife. 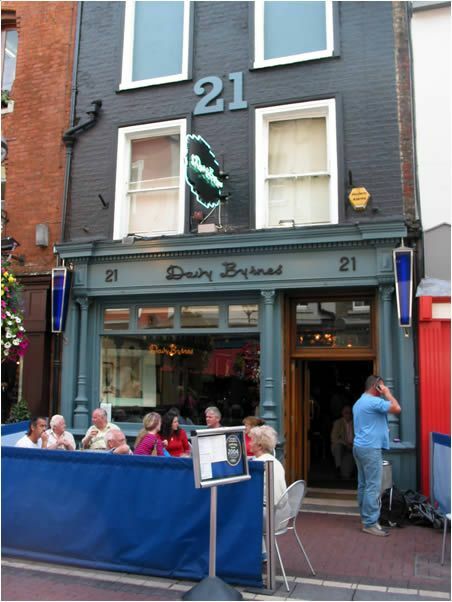 Davy Byrne's pub is a popular watering hole on Bloomsday, when literati descend on Dublin to celebrate the city's geography as explored in James Joyce's Ulysses. Photograph by DanMS, courtesy Wikimedia. This file is licensed under the Creative Commons Attribution-Share Alike 3.0 Unported license. On June 16, 1904, Irish author James Joyce had his first date with Nora Barnacle, the woman who would become his wife. Joyce later chose this day as the date in which all the events in his revolutionary, controversial novel Ulysses are set. Today, June 16 is recognized as “Bloomsday,” an international celebration of Joyce’s work in general and Ulysses in particular. Bloomsday is named after Leopold Bloom, one of the main characters in the book. Ulysses is a geographic novel, tracing the intersecting routes of its two main characters, Stephen Dedalus and Bloom, over the course of a single day. From the “snotgreen sea” and the River Liffey to the National Maternity Hospital and Davy Byrne’s Pub, Stephen and Bloom encounter the natural and built landscape of Dublin, Ireland. On Bloomsday, hundreds of “Joyceans” visit the “strand” (beach) on the Irish Sea, the quays (docks) on the Liffey, the gardens of the hospital, and Davy Byrne’s pub to honor what the Modern Library ranks as the best English-language novel of the 20th century.